Our impulse sealers are ideal for making your pouches tamper proof in a retail setting. We stock sealers for small and large pouches, with and without cutters. Please contact us for further details. Once you’ve chosen the right stand up pouch for you and received your order, it is important that you seal them effectively. We recommend using packaging heat sealers to get the job done. Whether you are sealing large masses of plastic pouches or smaller quantities of stand up bags, a heat sealer is the most efficient way to package your products to safeguard their quality. Since stand up pouches can be made from a variety of materials, not every heat sealer will work with the pouches you’ve chosen – spend some time researching the correct method of heat sealing is for the particular pouch type and application, or contact us for expert assistance. 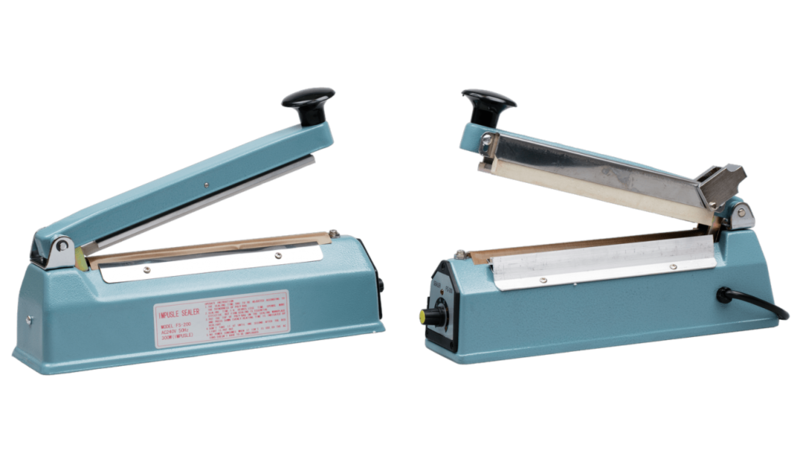 There are two main types of heat sealer – impulse heat sealers and direct heat sealers. The benefits of an impulse packaging heat sealer lies in the fact that it does not require warm up time. This type of heat sealer requires less power, meaning it’s more cost-efficient, and works splendidly with polyethylene, Mylar and foil stand up pouches. View our stock pouches for stock pouch packaging.